The Marula tree belongs to the same family as pistachio, mango and cashew. It is a truly African tree growing wild in the dry, hot southern parts of the continent where vegetation is otherwise sparse. The oil extracted from the kernels inside the nut of the butter-yellow Marula fruit is Africa’s own ‘Miracle Oil.’ Marula Oil is a relative newcomer to the west but has traditionally been used for thousands of years by the Tsonga people of South Africa and Mozambique. They have used it to moisturise and protect their skin and hair in the hot African sun and as a massage oil for babies. Marula Oil also forms an important part of the diet of many tribes and is even used to preserve meat. Some tribes preferentially used the oil over water to clean themselves. Marula oil is a clear, pale, golden-yellow colour with a nutty, sweet and very pleasant aroma. Highly stable and chock full of antioxidants, anti-inflammatory and anti-microbial properties, it has a long shelf life and does not need preservatives. It is ten times more resistant to oxidation than olive oil. It is rich in oleic acid, an Omega-9 fatty acid and also contains palmitic, stearic and linoleic acids as well as tocopherols, sterols, flavonoids, procyanidin, galattotannin and catechins. Marula Oil is light and fast absorbing due to the high amount of omega-9 fatty acid, which makes up around 70 -80% of the oil. The faster an oil penetrates, the less it is likely to clog pores and cause breakouts. 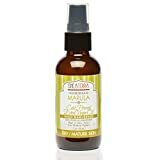 The anti-microbial properties of Marula oil protect skin from bacterial build up and the Omega-6 fatty acids help reduce acne and inflammation. As well as being protective, Marula Oil is hydrating and nourishing, with an ability to smooth and soothe dry, reddened skin. It can calm and heal sunburned and scarred skin and has proven to be very effective on radiation induced dermatitis – which is like having severe sunburn. The major benefit of Marula Oil comes from its incredibly high antioxidant levels which help reverse the damage to DNA and collagen caused by free radicals. This leads to less ageing, more elasticity and healthier skin overall. Marula Oil can be used on its own for massage or with the addition of essential oils. It’s great as anti-ageing moisturiser and for wounds, scars, burns, dermatitis, eczema, psoriasis and inflamed skin. It is suitable for the fine skin around the eye area and for reducing stretch marks, relieving sunburn and healing dry, chapped or irritated skin. It is added to lipsticks, face creams, body butters, eye creams and hair care, particularly for dry and damaged hair, but also good for oily hair. As a cooking oil, Marula Oil is very new but gourmet chefs are catching on to its unique nutritional qualities and taste. Unrefined Marula Oil has a low smoke point so should be treated the same as extra virgin olive oil and either heated gently or used in dips and salads or drizzled over cooked food. Due to its chemical properties, Marula Oil is being considered as a candidate for biofuel production. Steam or boil the potatoes until tender. Drain and set aside to cool. When cool, peel off the skin which should slide off easily and cut potatoes into cubes. Mix Marula Oil, lemon juice, salt and pepper together and pout over the potatoes. Cover and leave in the fridge to chill for at least a few hours. Lastly, add the chopped green pepper, onion and celery.